Sequencing is another time-honored tool that most composers use on a regular basis. Sequencing is the immediate repetition of a motive at a higher or lower pitch level. The motive can be almost any length the composer desires as long as it is not a complete repetition of the entire phrase. Often the motive is quite short, just a few beats or a single measure. I particularly like to use ascending sequences. They create a sense of growing intensity and anticipation, as if something important is about to happen. They work well as transitions to new sections or as a build up to an important climactic moment. There are a number of different types of sequences. Two of the most used sequences are exact and tonal. Example No 1 is an original melody which I used in my first blog post to demonstrate inversion, retrograde, and retrograde inversion. Example No. 2 is the same melody subjected to exact sequencing. All of the intervals in each sequence are exactly the same as the original melody. Accidentals have to be added to maintain the intervallic relationship among the notes. This is sometimes referred to as a modulating sequence because, with the addition of so many accidentals in measure 4, the phrase has essentially modulated to the key of C# major. Example No. 3 is the same melody subjected to tonally adjusted sequencing. None of the sequences have accidentals; therefore, the phrase remains in the key of F# minor. Three and out is the general rule for sequencing. In other words, whatever you decide to sequence should only be sequenced three times; anything longer feels predictable and tedious. In addition, it is advisable to vary the sequences. Change some of the notes or invert one of the sequences to keep the listener off balance. Most people are sophisticated enough to understand that a sequence is in progress and can predict what it will sound like as it unfolds. If one of the sequences, usually the third, is a little different, it will keep the audience off balance and engaged. If they can predict exactly what you are going to do next, you have lost them. Keep them engaged with unpredictable twists and turns. Example No. 4 demonstrates this concept. The last sequence is inverted; all of the intervals are upside down. I encourage you to play through these examples, then apply sequencing to one of your own melodies and see what happens. Enjoy! Augmentation and diminution are two widely used compositional techniques that can be applied to almost any melody. In this blog post, I will show you how to use these techniques to generate a plethora of new material for your next composition. There are two types of augmentation, rhythmic and intervallic. Rhythmic augmentation means that all of the note values in a given melody are increased by an equal amount. In most cases, rhythmic values are doubled, but they can be increased by almost any amount. Example No. 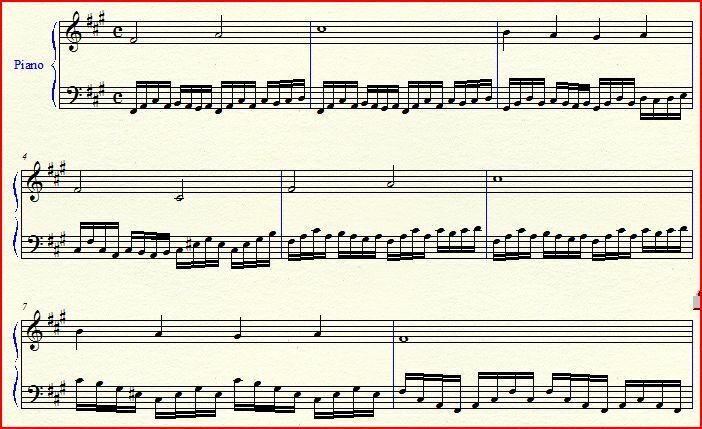 1 is an original melody used in my first blog post to demonstrate retrograde, inversion, and retrograde inversion. Example No. 2 shows this melody with its note values doubled. Intervallic augmentation means that all of the intervals increase, see Example No. 3. This changes where notes fall in relationship to the underlying harmony, so the accompaniment usually needs to be adjusted to compensate. Diminution is the opposite of augmentation. All of the note values and/or intervals are shortened by an equal amount, see Example No 4. Example No. 5 is an augmented version of the original melody with sixteenth-note accompaniment. The accompaniment pattern is also a good example of diminution in action. Counts one and two in measure 1 are the original melody in diminution, see Example No. 1. Notice it’s the same melodic contour in sixteenth notes. Essentially, Example No. 5 is derived from a single motive which is subjected to both augmentation and diminution. See what you can do with just a few ideas and an arsenal of composition techniques in your tool chest?